It's been a strange week here since the baptism. A few things are readable in the Hawkes Bay Today, where I'll place links to because I'd rather not detail it. The highlight was it rained enough in a few days to flood our road below near the marae. It also kept me from going to work for three days, of which I grew withdrawals symptoms. I enjoy my job and after the first afternoon off, I was ready to build an ark and row to work. 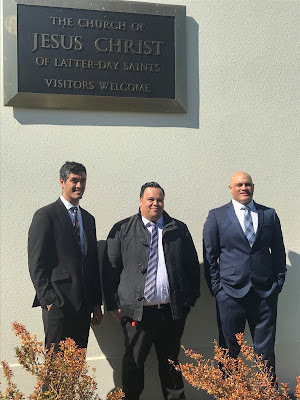 I always said this place could do with a baptism and after this past week, you are going to agree after reading the articles. I thought issues going on here in and outside of the family would be enough to push me out, but after talking to Mitchy about stuff this afternoon we decided that we aren't the ones that need to leave. This is our home. What people bring into the community is their filth and doesn't reflect our community as a whole. Also ... Livian got called into the Bishopric of our ward today. I don't know any person more suited for the assignment and they'll be a trio that will compliment each other and bring much spiritual mitigation to a ward that's been needing a lift for a while. I got backs chaps .. still not accepting a speaking assignment, but I got backs. I am glad it’s done and dusted. It’s 3:16am in the morning and I’ve been laying in bed since 10pm trying to get a few burdensome things off my mind, but no dice. I mentioned in the last blog post that there was a kink in our family chain. Today while sitting at my Mums I got to see the ripple effects of that kink and it hurt my heart enough to leave an impression that has me awake right now replaying it in my head. I hate that I have witnessed it. It was only 13 words spoken in an exchange, but it was 13 words too much for me and during the exchange, the room literally felt cold. After this baptism, I’m withdrawing from any future family occasions until my family remember how to be one. We’re taught that family is important, we just choose when to remember that principle. I haven’t taken sides in the battle that isn’t mine. I see where both parties are coming from. I don’t want to be part of it. I don’t want to see what it’s doing to everyone. Hubs is offficially 8 today and later this afternoon she’ll be baptised. I just need to get through tomorrow and then I’ll be back at work away from it all for another week. I hope, at the very least, that Hubs has a great day today.